We’ve had an amazing competition and we've already got great plans for next year’s events! A huge thank you goes out today to Goresbrige Go for Gold, to our class sponsors and to our fantastic team of volunteers….we couldn’t do it without you.!!!! Here’s the update from our final day…. Fantastic rounds to watch! No change to the overnight standings, as they all jumped clear, with Jonelle Richards just picking up one time penalty. 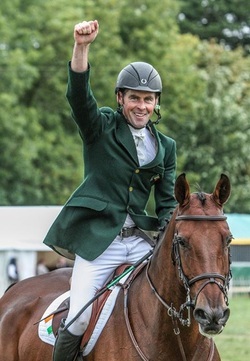 Joseph Murphy finished on his dressage score of 50.8 to win the CCI3* in style. Izzy Taylor took 2nd place (Thistledown Poposki), Jonelle Richards came in 3rd (Classic Moet) and Louise Bloomer finished the day in 4th place (Goodwins Glory) Well done Joseph! Second Supreme was the only horse in this class to go clear today so Pippa Funnell maintained her lead to win, finishing impressively on her dressage score! Kevin McNab and Sarah Ennis were unlucky today which resulted in Patricia Ryan and Tullineaskey Hi Ho moving up to take second place, with one pole down. Melanie Ashe, with Rathmoylan Flight, also had a pole down and finished 3rd. Completing the leaderboard were Michael Ryan (4th – Ballylynch Skyport, Izzy Taylor (5th – KBIS Starlet) and Fraser Duffy (6th – Primus). Even with 8 jumping penalties today, Sam Watson took the honours in this class, with Imperial Sky. He had a lovely clear round with Horseware Lukeswell, so also took 3rd place. Oliver Townend’s clear round on ODT Quizzical moved him up the leaderboard from 5th to 2nd. The 3rd-6th placings in this class went to Wills Oakden (Mericano), Luke Drea (Gorsehill Pearl) and Jodie O’Keeffe (Kachemire Le Beau). Jonelle Richards was unlucky to have a pole down and that dropped her from the top spot down to 5th in the final placings. That meant Camilla Speirs and Portersize Just a Jiff won the class….that’s the way to come back!!! Fraser Duffy also went clear, with Fernhill Revelation, to claim 2nd spot and Australia’s Kevin McNab finished 3rd on Brookfield Cult King. 3rd-6th in this class were Michael Ryan (Ballylynch Wizard), Jonelle Richards (Aloha) and Pippa Funnell (Sandman 7). There was only a pole separating the top 6 riders and Sarah Ennis (Shanbo Queen B) and Jo Aston (A Touch in Time) were in joint 1st. Jo was unlucky to have one down but Sarah rode a brilliant round to take home the top prize. Well done Sarah! Congratulations also go to Jo Aston and Julian Stiller who finished in 3rd place, with Chwupdiwup. 4th-6th placings went to Capt Brian Curran Cournane (Stonehavens Tonduff), Roberto Scalisi (Up 2 U) and Ann Taylor (Striker IV). There were no clear rounds in this class today, so the leaderboard saw some changes…Grace Taylor (Animator II) celebrated her 18th birthday in the best possible way by winning the class, so two reasons for her to pop a champagne cork tonight! Well done Grace and Happy Birthday from all of us! Aoife Daly came in 2nd, with Limbo Rock and Sinead Boyd took 3rd place, with Kiltealy Flight. Completing the line up were Ellen Fitzsimons (4th – First Night), Sahnya Shiels (5th – Rowanhill Master Clover) and Lucca Stubington (6th – MJI Belle Bonita). The triple combination caused some trouble for this class and there were no clear rounds but Isabelle Odlum (Blue Venture) held on to her overnight lead to win the class, with Sophie Buller (G Maha) holding onto 2nd place and Dara Kiernan (Bocade Slo-Mo-Shun) moving up to 3rd. These were the first riders to try out the new show-jumps and the top 8 riders went clear so congratulations to Sarah Ennis (1st – Bridgemans Cocoa Malt), Michelle Kenny (2nd – Limbo Kaiser), Elizabeth (3rd – Soladoun), Patricia Ryan (4th – Kilpipe Jewel), Heidi Hamilton (5th – Dam Easy) and Lucy Latta (6th – Cleo Ferro).